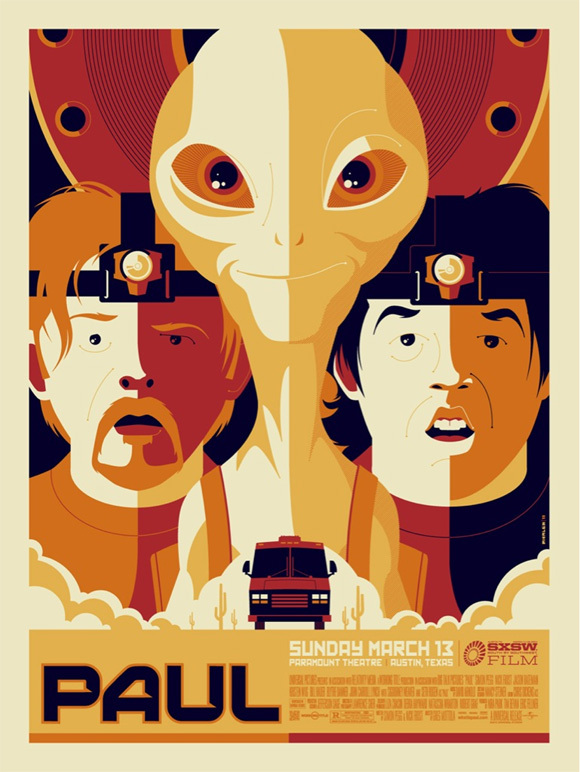 We're still a couple weeks away from the March 18th release of Greg Mottola's sci-fi comedy Paul starring Simon Pegg and Nick Frost but five days earlier the movie will premiere at the SXSW Film Festival in Austin, Texas. If you haven't seen the several hilarious trailers then you're missing out on some great laughs and excitement for one great looking comedy. We've already seen a couple posters for the film too, but now collectible poster shop Mondo has unveiled a poster by Tom Whalen made for the SXSW premiere, only available for purchase at the festival itself. But of course you can check out the poster below for yourself. Paul is directed by filmmaker Greg Mottola, of The Daytrippers, episodes of "Undeclared", Superbad and Adventureland previously. The screenplay was written by the two co-stars, Nick Frost and Simon Pegg, of "Spaced" and Shaun of the Dead fame. Apparently they rebuilt most of the Comic-Con showfloor out in New Mexico to shoot some of the big convention scenes in this. Universal is bringing Paul to theaters everywhere on March 18th next month. Stay tuned for more updates and visit the official website: whatispaul.com. saw this movie at a screening about a week ago- it was pretty funny, but not as funny as you'd think. its the only time i've liked seth rogan though. This poster is indeed Rad. Poster's pretty fresh, still got zero desire to see this.